This puzzle is a series of levels requiring you to transform a given word into another word or phrase. You play as Bowser and his minions, who are sharing a Super Crown in order to impersonate Peach and attempt to run her cooking show. (The Super Crown is an item from the game New Super Mario Bros. U Deluxe, but knowledge about the game or the Mario universe is not necessary for the puzzle.) Each character has a different power, and you'll need to find the right order of operations to complete each level. Delete all instances of the alphabetically-first character. Switches all Rs to Ls and vice versa. All vowels get replaced with the vowel before them, immediately followed by the vowel after them. If the phrase is longer than 20 characters, only the first 20 characters will be kept. Spaces at the beginning and end of the phrase will be deleted. Multiple spaces in a row will be replaced with a single space. 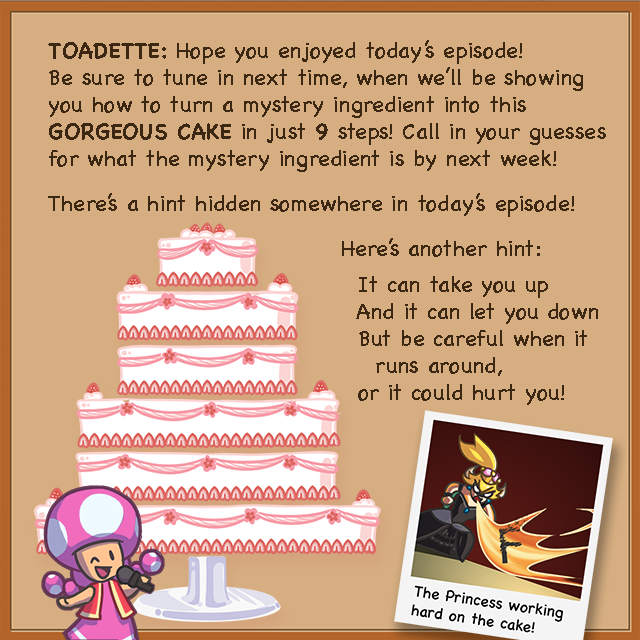 The hint "hidden in today's episode" can be found by taking the first letters of each target dish. This gives the phrase USE EACH POWER AT LEAST ONCE. The level select screen, which shows the same cake, can be helpful for discovering this. 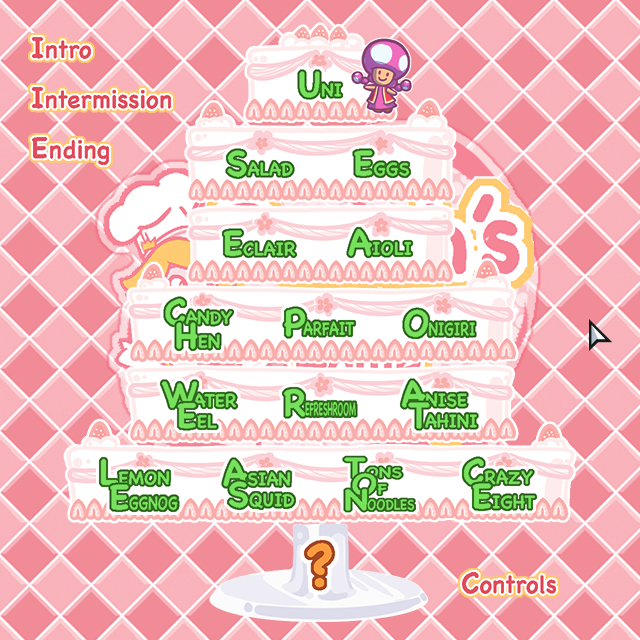 Since the words on it transform from the starting ingredient to the ending disn name when a level is finished, when all levels are finished, the phrase can be read off of the larger letters on the cake. Since we must reach GORGEOUS CAKE in 9 steps, this means exactly one power will be used twice. The final page also shows Bowser torching F to pay respects, which suggests that in reverse his power will effectively be "creating" an F somewhere in the word. We can reconstruct the operations that were applied by working backwards, with some trial and error. The most constrained operations to apply are Piranha Plant's (which requires a roughly equal number of letters on either side of the space) and the Boo's (which requires all vowels to exist in specific pairs), so it's easiest to build a solution around being able to apply those two operations. The answer is SKILIFT, which also fits Toadette's second hint. Remember to get off when you get to the top! Like Portal games, games involving Peach often end with cake! Unlike Portal games, since many of you reeeally seemed to want the extraction to come out of the last page, we made the extraction come out of the last page! We hope more of you believe in the cake now. We considered playing 'Never Gonna Give You Up' on the final page, but thought that might prompt a few too many incorrect guesses. Note that levels had many possible solve paths. Getting an optimal length solve path was not necessary, as long as the number of moves was 10 or fewer. A good strategy for the harder levels is to work backwards from the target phrase, figuring out which moves are possible and trying to set it up so that Blooper or Wiggler can be used as often as possible to remove extra letters in the final phrase that don't appear in the starting word.